Next up in my series focusing on fantasy comic books is a new series that is a combination of the Hangover, Dungeon & Dragons, Bridesmaids, Pineapple Express and Lord of the Rings mixed together in a martini shaker and mixed into a fine concoction of brutal in your face action, adventure, booze drinking, drug toking, humor and violence. Written by Kurtis Wiebe, drawn by Roc Upchurch and published by Image, the series just had it's sixth issue released a few weeks ago so there isn't a lot to catch up on. You can can get the first trade paperback for $9.99, that is a bargain for you my friend and something you should jump on. 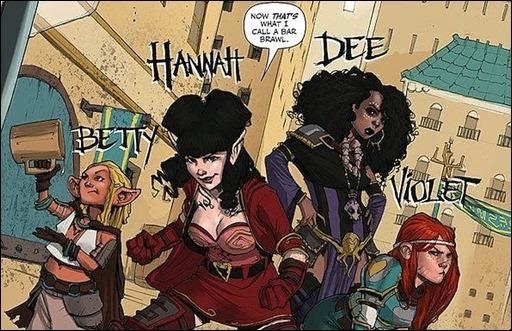 Rat Queens centers on a all female adventuring group of the same name. 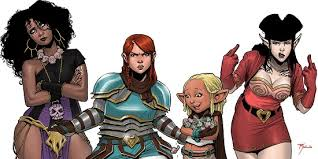 Led by the elf mage Hannah, Violet a dwarf warrior, Dee an atheist cleric and Betty the halfling thief. Each of them have are powerful personalities and play second fiddle to none and it is impossible not to fall in love with Betty. They set up base in the town of Palisade where they're known as trouble makers and have heated rivalries with some of the other adventuring groups. I can't express how much fun this comic is. Like Skullkickers its reminds so much of my own days of playing Dungeons & Dragons. In fact I'm pretty sure my friends and I have through similar adventures and mishaps. Wiebe and Upchurch have nailed all my needs and wants for a fantasy comic and is right up there with the best fantasy comics of all time. It's that fun and just solid in every way imaginable. Go read it!